Franz Schubert may not have been an expert dancer, but he certainly was an extremely skilled composer of dance music. Most of his numerous dances – often miniatures comprising only a few chords – were improvisations created for special occasions, such as house parties. And many of these impromptu waltzes were noted down by Schubert later, including several pieces for piano four hands. Brahms, who held Schubert's music in high esteem, remained faithful to his own majestic musical language in his Sixteen waltzes op. 39 and yet managed to make each of these small masterpieces entirely different from the others. Edvard Grieg's two Waltz caprices also audibly reflect the composer's frame of mind, with the waltz flashing up more like a memory of remote countries and customs. Paul Hindemith, on the other hand, seems to have regarded his Eight waltzes op. 6 as a field of research rather than a matter of personal concern: highly original but with a hint of roguishness. 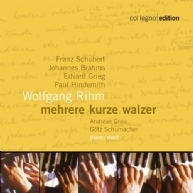 And Wolfgang Rihm's waltzes on this CD "...practically summarize all preceding 'episodes in three-four time' – a retrospective of the waltz from today's perspective." (Sebastian Urmoneit) A heady, electrifying waltzing anthology by the brilliant piano duo Grau/Schumacher.